Prince Industries of Carol Stream, Ill., is a precision contract manufacturer of machine components, assemblies, hydraulic valves and fabrications. It serves customers in the construction, telecommunications, industrial controls, dental, exercise, healthcare and the peripheral computer (printing) industries. The company often runs aluminum, brass, steel and cast parts for customers in the automotive, medical and environmental markets. The company wanted to expand through a flexible manufacturing system in order to reduce setups and run lean processes domestically that would be competitive with global production and be more responsive to customer needs. It wanted to run at least 20 hours per day and have the ability to deliver a completed part from the design to production stage in a shorter period of time. In one work cell at Prince, there are two a61 machines, an a71 and the MMC2 system. This flexible manufacturing cell is used for high-mix and low- to medium-volume orders. The S33 machine provides Prince with a flexible mini-cell for quick setup and changeovers. This cell is used for running short, flat parts of 10 to 15 count batches with the automatic pallet changer. Efficiency is at 95 percent with the flexible manufacturing system in place. Prince runs 24 full pallets of work around the clock, seven days a week. A part has never been rejected, and all scrap has been eliminated. Every part comes off of the cell and goes straight to the customer. Throughput time from raw material to finished product has been reduced by 50 percent as Prince is able to go from producing three to four parts per hour on stand-alone machines to six parts per hour. In addition, the flexible manufacturing system provides immediate response for managing workloads, enabling Prince to practice lean principles. If the company receives an order from a customer, it can acquire material the same day, provide one setup and then start production immediately. In addition, customers with lower volume jobs receive the same part cost as they had with mass production runs. Quality has increased. Prince can manage three-dimensional parts having tight tolerances on several different positions, with diameter tolerances of 0.00052 inches. The company estimates it’s saving 20 to 30 percent in cycle time on tool changes alone. 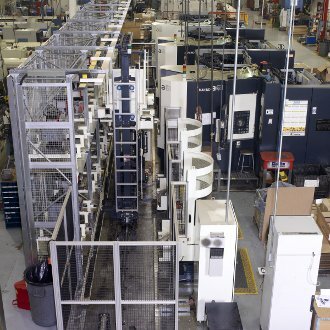 It runs a flexible manufacturing system for 22 hours a day and has yet to have one rejected part come across its machines. The new cell means less setup and less labor. Operator intervention has been reduced from one operator per machine per shift to one operator per three to four machines per two shifts. Prince can run three jobs simultaneously while the operator prepares the next three jobs within the cell. The flexible manufacturing system enables prototype development at Prince—helping the company take a part from cradle to market in record time. It is estimated that with all of the time saved and related benefits, the MMC2 and associated horizontal machines will have paid for themselves in one and a half years. The tools that were added to the S33 mini-cell eliminate post-production deburring, saving on benchwork, cleanup washing and post-production time. This efficiency gain eliminates another 5 to 10 percent in cycle time.